There will be new issuance of £11.3bn in UK listed investment companies over the next three years with two thirds of this new issuance to occur in alternative investments.”The number of alternative investment companies launched in the last five and ten years was more than twice as high as that of equity investment companies. So, while the performance of equities has been strong, the market has clearly been calling out for alternative investments, ” according to Joachim Klement, Head of Investment Research at Fidante Partners, an international asset management business. However, whilst listed investment companies engaged in alternative credit strategies are expected to continue their boom, listed hedge funds are expected to experience shrinkage over the next three years. Over the last ten years UK listed hedge funds in investment company format had an 8% annual growth rate. 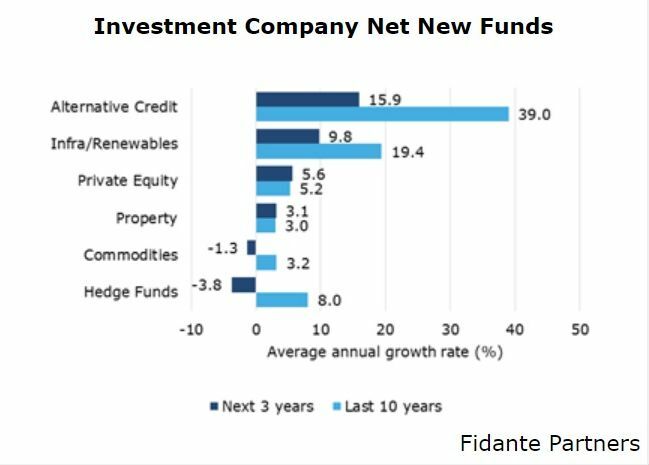 But reflecting the declining appeal of hedge funds, Fidante Capital forecasts that there will be a net decline in capital over the next three years as fewer new investment companies engaged in hedge fund strategies are launched. Fidante Partners is an international asset management business that partners with talented investment teams to deliver accelerated business growth. As a multi-boutique investment firm Fidante builds successful alliances with traditional and alternative investment managers. Fidante Capital (a division of Fidante Partners) supports the structuring, IPO and ongoing development of closed-end investment companies providing investors with access to alternative investment strategies in a listed fund structure. Fidante Capital offers a comprehensive range of services including corporate advisory and broking, research, distribution and market making. Fidante has offices in Sydney, London, Stockholm and New York, and is fully owned by Challenger Limited, a large ASX-listed investment management firm.